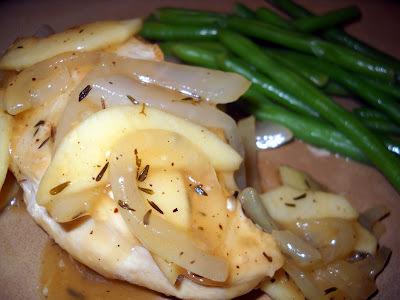 Looking for more apple recipes, I came across this one for chicken. I liked it because it seemed perfect...easy, yummy, and a great fall dish! And it was very good! The only thing that I did different from the recipe was I cooked the chicken in sesame oil instead of olive oil. I served it with steamed green beans. A starch such as rice would also work well. I always try to include the 3 parts of an entree when I make dinner (protein, starch and a vegetable), but didn't that night because it was already late and I was already tired and I slacked off a bit. Nevertheless, it was still really good. It's not the most fancy meal but if you're looking for something that tastes good and is easy to make, this is a good one to try! 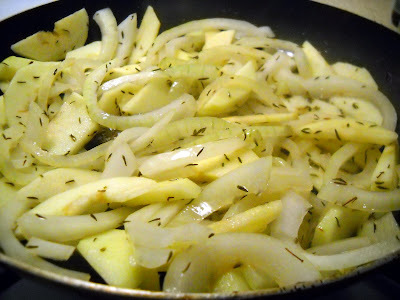 In heavy skillet, heat 2 teaspoons oil over medium-high heat; cook apples, onion and thyme for about 4 minutes, or until just tender but still a bit crisp. Remove to bowl and set aside. 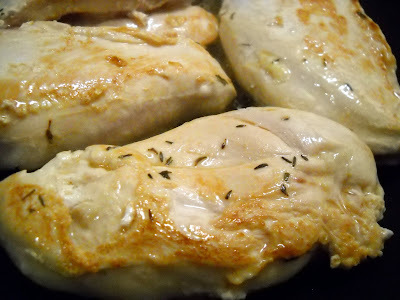 Add remaining 2 teaspoons of oil to skillet; cook chicken, turning once, for 2 to 4 minutes or until golden brown on both sides. Reduce heat to medium low. 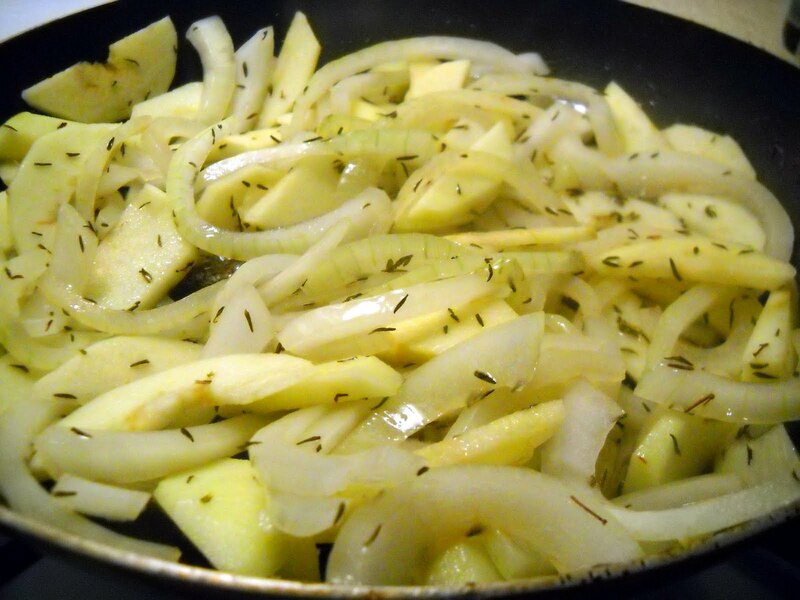 Set 1 tablespoon apple juice aside and pour remaining juice in skillet along with the cider vinegar. Cover and simmer for 6 to 8 minutes, or until chicken is cooked through and juices run clear. With slotted spoon, remove chicken to platter; keep warm. Combine cornstarch with reserved tablespoon apple juice; stir into skillet juices and cook over high heat, scraping up any browned bits, for 2 minutes or until thickened. Return apple mixture to pan and heat through, season with salt and pepper. 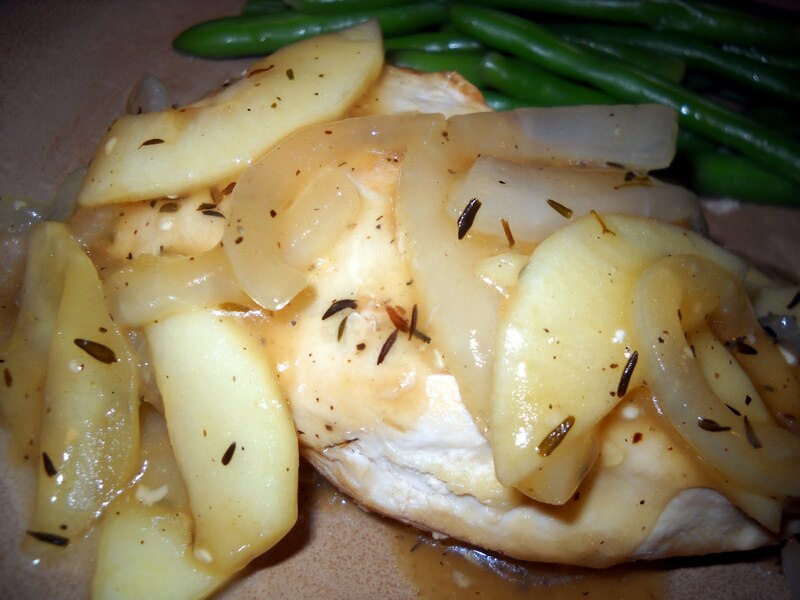 Spoon apple mixture around cooked chicken.